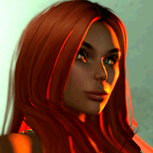 New Rhiannon avatar needs to ride astride. I've sent a suggestion to LL about this issue, but I'm not sure how often they look at those. In case you don't know the new Rhiannon avatar comes with a bento horse. So I was a bit excited and wanted to try it out. Someone at Linden Labs decided she should ride side saddle and not astride. *sigh Now, maybe that would be a cute option to have, but she can only ride side saddle. I tried to add the male's horse AO, but it works only for male avatars. It was once considered "vulgar" for a "proper" lady (Hope you sense the sarcasm...) to ride astride. I like to think we're beyond that now, especially at LL. So please give us the option, at least, of riding astride. Thank you.